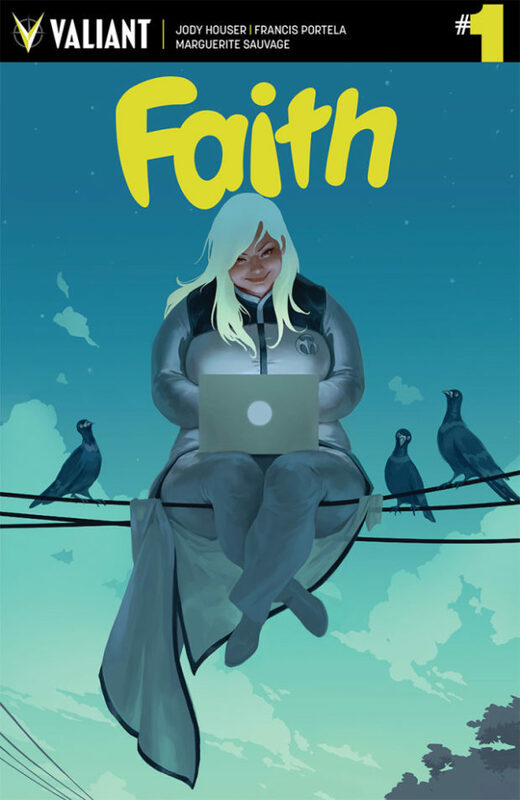 Graphic Novel (Guest) Review 51/365: Faith – Valiant Comics Week! So, my Comic Book Teacher Crew or CBTC, as we never call ourselves, are each big fans of different Valiant titles, and that’s great because as the guest reviews came in this week, no one wanted the same book. I guess that speaks to the Valiant line of comics and how diverse they are. Today’s review is of my of my faves from my buddy Michael. Valiant Comics Week! Faith has taken the comic world by storm. It has smart writing, action packed panels, and just enough humor to make you smile at least once every three pages. Sure, lots of graphic novels can say the same, but this book has something no other title has – the titular character of Faith herself. Faith is a woman and a superhero, qualities that are not uncommon within the genre. What makes this particular woman superhero unique is the fact that she does not possess a gravity defying body which remains primarily unhindered by clothing. Faith (and by extension, her alter ego Zephyr) has a more realistic body type and wears a stylish and conservative costume when she fights crime. She is a powerful, confident, and genuinely funny character who jumps off the page. Who she is on the outside might make you curious, but she transcends her physical appearance and exists as a smart, resourceful, and flawed individual whose fantasies often match up with our own. In fact, Faith’s imagination is a huge part of the book as she often conjures up her dream scenarios in a way that any reader can relate. She is also a huge comic book geek and the book is riddled with pop culture references that are sure to appeal to ComicCon nerds everywhere. The first trade paperback picks up from where the character left off after her introduction in Harbinger as Faith dons a wig and glasses (remind of a certain super girl, by any chance?) and tries to take on a new identity as a content creator for a gossip website. She is forced almost immediately to reveal her identity to her co-workers because, in this world, a makeshift disguise isn’t enough to hide you in plain sight and the bad guys come a-knocking right out of the gate. Faith loves being a superhero and that’s a huge part of what makes this book so fun to read. She’s doing what most of us would if we had access to amazing powers, she’s reveling in it and enjoying the fame, admiration, and notoriety. At the same time, she keeps her head on straight, always tries to make the right decisions (like breaking up a puppy heist ring), and not exploiting and wasting her talents like her reality television star ex-boyfriend and fellow superhero Torque. Faith flies high, makes her own rules, and is a role model in her world and on the comic page and kudos to Valiant for creating such a fun, unique, and praiseworthy female hero. Let’s hope that the other publishers follow suit and start giving us heroes of all genders that the rest of us can identify with. I highly recommend this for your personal or classroom library. I want to thank Michael for the review of this awesome book! Check back the rest of the week for amazing Valiant titles!